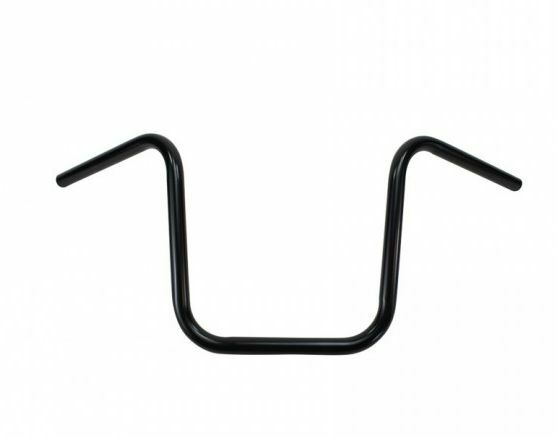 (Dimpled or Non-Dimpled) SIMPLY EMAIL YOUR CHOICE Our 12" Rise Springer Apes Handlebars are made in the USA from 1 inch OD x 0.109" wall premium American steel tubing. They are CNC mandrel bent for ultra-smooth bends and flawless symmetry. Knurled riser clamp locations are 4.75" on centers to fit most aftermarket springers (Moto Iron, Paughco, DNA, Hardbody, etc) and stock Harley springer front ends. With 12" of rise and sufficient pullback, these bars are tall while remaining very comfortable. These bars generally require extended cables, brake lines, and wiring on most Harley models. Does not fit throttle by wire models..